Today, GreenToTee Golf Academy employs PGA Professionals committed to the premise that extraordinary training is achievable through hard work, dedication, and personalized focus on the student. GreenToTee started as the brain-child of Joe Bosco and Peter Donahue with office space in a one-room, low-rise office building in Northbrook, Illinois. Joe and Peter initially focused on "rhythmic training" techniques to emphasize the concept of consistent approach to the ball as a means of consistent shot-making. Rhythmic Golf evolved into one aspect of a comprehensive approach to golf training that incorporates a personalized approach to golf performance on the course. Personal interests, philosophy, and self-motivation are incorporated into a personalized curriculum specifically designed with each individual student in mind. 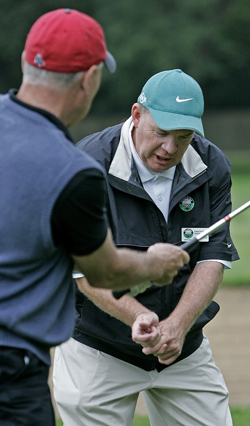 With the success of GreenToTee's training philosophy for individual instruction, Joe Bosco and Ed Gubman (Senior Consulting Partner for over 25 years) developed a training method designed to utilize the game of golf as a means of corporate team-building, and team-oriented discovery. 1989 to 1992 Incorporated as a golf academy and incubated out of the Winnetka park district with 1 indoor hitting station and a driving range. 1992 to 1994 Added a 3500 square foot indoor teaching studio at 3100 Dundee Rd Northbrook and acquired management and operations at Thorngate Country Club and Golf Range. Created Strategic alliances offering special golf training programs with Winnetka Park District and the Barrington Park District. 1994 Added 5000 Square Foot indoor training studio. 1995 Started offering lessons at the Nordome Indoor Driving Range at sportsman Country Club. 1996 Moved to Willow Hill Golf Course. 1999 Nordome blew down in a tornado on May 19th, Green To Tee began alliance with Midlane GreenToTee Dome in Highland Park. 2000 to 2004 GreenToTee Created an alliance with the Glen Club in Glenview, IL offering a special scoring school and on course training. While continuing to offer their full range of services at Willow Hill Golf Course in NorthBrook. 2004 to 2011 GreenToTee creates a new partnership with the Glencoe Golf Course, moving their year round training facility to the course, offering indoor training during the winter and outdoor training durning the spring, summer and fall. 2012 to present GreenToTee has evolved into GreenToTee Golf Training and Junior Golf Camps at The Golf Practice. This golf academy outgrew the Glencoe Golf Club facility. The PGA Professionals moved their year round training facility to their own Indoor Training Studio at 1582 Old Deerfield Road, Highland Park, IL 60035. Look for exciting new developments to help The Golf Practice growth.